There are a range of advantages and disadvantages of wind energy to look at, including the many problems associated with wind turbines. The main disadvantage regarding wind power is down to the winds unreliability factor. In many areas, the winds strength is too low to support a wind turbine or wind farm, and this is where the use of solar power or geothermal power could be great alternatives. Wind turbines generally produce allot less electricity than the average fossil fuelled power station, requiring multiple wind turbines to be built in order to make an impact. Wind turbine construction can be very expensive and costly to surrounding wildlife during the build process. The noise pollution from commercial wind turbines is sometimes similar to a small jet engine. This is fine if you live miles away, where you will hardly notice the noise, but what if you live within a few hundred meters of a turbine? This is a major disadvantage. 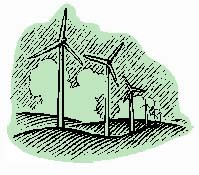 Protests and/or petitions usually confront any proposed wind farm development. People feel the countryside should be left in tact for everyone to enjoy it's beauty. So there we have the main advantages and disadvantages of wind power on the surrounding environment, and the general reliability of wind turbines.